I don't know about you, but I'm very much a goal-oriented person. I thrive with challenges, especially if I have a routine. That's why I want to share my 2016 goals with you all. It will help hold me accountable, but more importantly, I'll have a reference point. 1. Read Devotional Every Day - I have a few different devotionals, but I'm going to start with one (Jesus Day by Day by Beth Moore) and work my way into another (Jesus Calling) by Sarah Young when I finish the first. I'd really like a mother of a daughter type devotional after that, so I'll be looking for recommendations. I hope to do this each morning as I drink my coffee, but I know life (ahem, a baby) can get in the way of plans like that, so I'll fit this in wherever I can. 3. Breastfeed Annabelle to First Birthday - I know, I know... she never would eat "correctly"... but I am pumping like a mad-woman and even have a whole additional month of milk stored in the freezer now - over 700 ounces! At the rate I'm going, I should be able to stop pumping sometime in May and still feed her my milk exclusively (we will add normal food too but keep her rate of breastmilk the same) until her first birthday in September. 4. Finish Cookbook - This isn't something huge... it's not like I'm planning on publishing a cookbook... but I do want a nice, organized, easy-to-follow book of all of the recipes my family enjoys... which is a huge undertaking since we try LOTS of new meals all the time. I currently have recipes printed from the Internet in a basket... we keep all the ones we like. I am going to type each one up in the exact same format so it's easy for me to make each one when I'm busy in the kitchen. I do have this project started, and I'm hoping to be done typing my current recipes by the time we move at the end of March, so I can focus on printing and putting together my book once we arrive at our new home. 7. Read 16 Books - Last year, I failed at reading the amount I set out for - 26 - but I think that whole having a baby thing got in the way a bit. I chose to keep my goal number lower this year in hopes that I won't give up. I use Goodreads to track my progress, find new books, and review the ones I read. I'd love to be friends - find me here. 8. Set Monthly Goals to Stay Motivated - That's right - I'll be posting monthly goals on the blog and sharing how I did with them the next month. I know a few other blogger friends do this, and it seems like a great way to focus on short-term goals, so I'm going to give it a go! 9. Focus on My Digital Shop - I have unfortunately made the decision to close my shop, Two Cats Decorations. I love making products for people, but I hate packaging and shipping. My tile magnets are too fragile to pack haphazardly, and I was wasting way too much time preparing them for shipment... time I could be spending with sweet Annabelle. My husband was awesome about helping (he always is), but the amount of money I brought in from the shop in 2015 wasn't enough to justify staying open. Instead, I'll focus on my digital shop, Printspirational Art Co., since there's no packaging involved, and it'll be easier to keep up with on a day-to-day basis. I can always turn my shop off during busy times and not even worry about it! 10. Be Intentional About Life (being a wife, being a mother, being a friend, being myself) - This one is also pretty self-explanatory. I want to make sure I'm being genuine and trying my hardest to fill my roles in life. That's pretty vague, I know, but I'm hoping this one kind of guides me. Such a great list! I want to put together a cookbook too! I have the same problem. We're always finding new favorites thanks to Pinterest. Right now I'm using a binder with page protectors so I can rotate recipes in and out. Eventually I'll put together a bind-up. 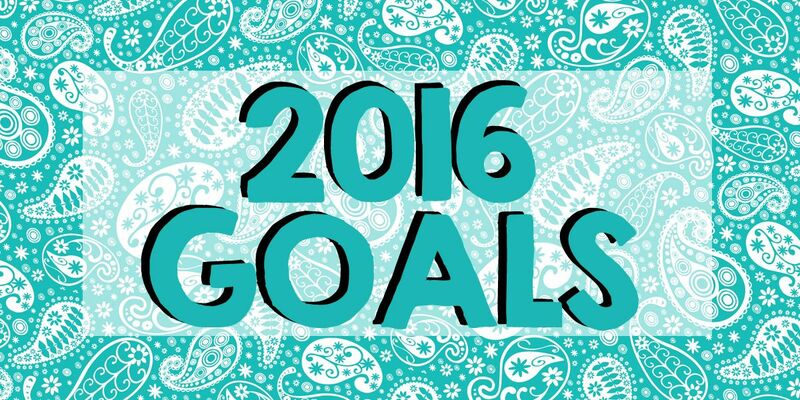 I love your 2016 goals! The Beth Moore and Sarah Young devotionals are really good. I love your list and have used both devotional books you mentioned and they are both excellent. I have a friend who is the Mom to 2 young girls and used devotional books a lot so I will see if she has any recommendations for you. I would love to make my own cookbook with all of my family recipes I enjoy eating! That's such a good idea. I also made a goal to post 2 times a week. We will see how well that goes! Good luck with the rest of your goals! I'm looking for some good devotionals. Do you like the ones you're reading? This is a great list! I would love to hear what you think about your devotionals. I am looking for some as well. I am in the same boat that my goal is to blog at least twice a week. It can be really hard with baby and work, but I don't want my only posts to be my recap monthly goal ones. That is awesome about your pumping by the way! Keep up the great work!